•••• Shinjuku-Sanchome, Exit C7: Using the Marunouchi, Fukutoshin, or Shinjuku subway lines, look for the signs leading to Exit C7. When you come out the exit, you will be going north. Continue that direction for 40 meters, until you get to Yasukuni Blvd. (the corner with the police box, or "koban"). Cross the street, and turn right. Go down Yasukuni for 200 meters until you reach a Lawson 100 store. Turn left at that corner. Continue up this street for 170 meters until you reach the end. Lakeland University Japan will be at the end of the street on the right side. 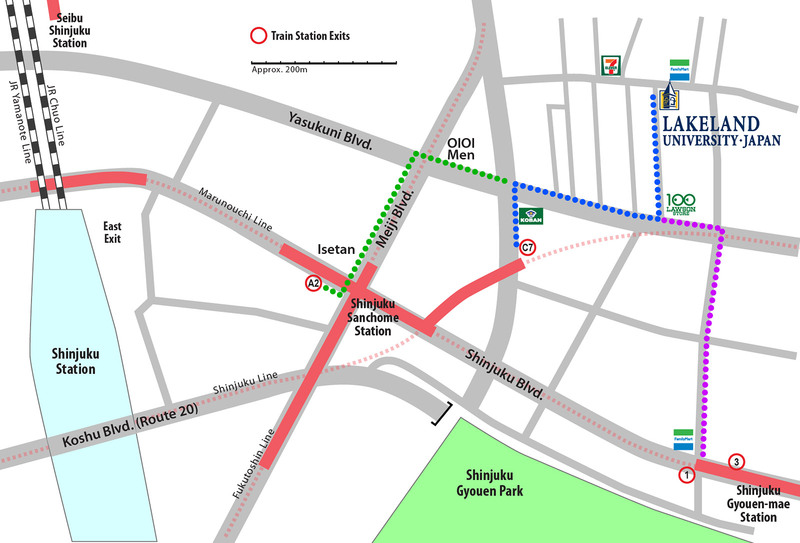 •••• Shinjuku-Sanchome, Exit A2: Using the Marunouchi subway line, come out of Exit A2. When you reach the street, you will be facing north. Turn right and almost immediately you will reach the intersection of Shinjuku and Meiji Boulevards. turn left to cross Shinjuku Blvd. and continue walking north along Meiji for 180 meters until you come to Yasukuni Blvd. Cross Yasukuni, then turn right to cross Meiji, and begin walking east down Yasukuni. Keep walking down Yasukuni for 320 meters until you reach a Lawson 100 store. Turn left at that corner. Continue up this street for 170 meters until you reach the end. Lakeland University Japan will be at the end of the street on the right side. You could use the Isetan exit B3 and come out on Meiji Blvd., but some people find that a bit trickier. •••• Shinjuku Gyouen-Mae Station: Using the Marunouchi subway line, get off at Shinjuku Gyouen-Mae Station. If you are traveling toward Shinjuku, you will leave via Exit 1; If you are traveling toward Ginza or Ikebukuro, you will leave via Exit 3. Using Exit 1, walk up the stairs until you reach the street; you will be facing north. Cross the street. Follow the directions after the following paragraph. Using Exit 3, walk up the stairs until you reach the street; you will be facing south. Turn right upon exiting, and walk to the nearest corner. Turn right. Walk north (the direction you were heading in either of the previous paragraphs) about 300 meters until you hit a wide 3-lane boulevard; that is Yasukuni. Cross Yasukuni, and then turn left. In about 60 meters, you will see a Lawson's 100 store. Turn right at that corner. Continue up this street for 170 meters until you reach the end. Lakeland University Japan will be at the end of the street on the right side. Other Routes: From JR Shinjuku Station, come out the East Exit, and follow the underground signs taking you to Shinjuku Sanchome Station. When you get to that area (after approx. 400 meters walking), look for exits A2 or C7, and then follow the directions above (blue or green). If you come from JR Shinjuku Station but prefer an above-ground route (recommended only if you know the area fairly well), then come out the East Exit and make your way to Shunjuku Blvd. (the street with Studio Alta and Kinokuniya Bookstore). Walk east (in the direction of Yotsuya) for about 340 meters until you reach Meiji Blvd. Turn left (north) on Meiji, and walk another 180 meters until you reach Yasukuni Blvd. Turn right on Yasukuni, and walk east for 320 meters until you reach a Lawson 100 store. Turn left at that corner. Continue up this street for 170 meters until you reach the end. Lakeland University Japan will be at the end of the street on the right side. If you come from JR Shinjuku Station but for some reason come out the South Exit, make your way to Route 20 (Koshu Blvd.). When you reach the street, turn to the east (there are exits on both sides of the street, so turning left or right depends on which side you came out). After about 300 meters, you will reach Meiji Blvd. Turn left, and go down Meiji for about 300 meters until you reach Yasukuni Blvd. Turn right on Yasukuni, and walk east for 320 meters until you reach a Lawson 100 store. Turn left at that corner. Continue up this street for 170 meters until you reach the end. Lakeland University Japan will be at the end of the street on the right side. If you come from Seibu Shinjuku Station, come out the South Exit and continue walking south until you reach a wide boulevard; that's Yasukuni Blvd. Turn left (away from the underpass), and walk down Yasukuni for 850 meters (crossing Meiji Blvd. and another wide avenue along the way), until you reach the Lawson 100 store. Turn left at that corner. Continue up this street for 170 meters until you reach the end. Lakeland University Japan will be at the end of the street on the right side.